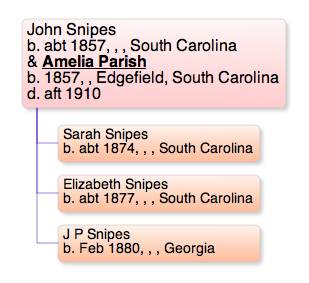 I've been working on extending a few collateral branches of my family tree. I've been trying to trace the descendants of my Great-ect-Great-Aunts and Uncles (I wrote about why this is important here). While doing this I realized something about how I relate to some of the half and step families in my tree. It's a little odd, so I'll explain it with an example. The parents of my Great-Grandfather, Nathan Britt, were not on their first marriages when they had Nathan. His father, William Britt, was on his third marriage. His mother, Amelia Parrish, was on her second marriage. 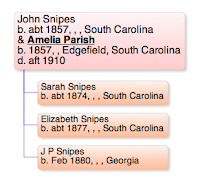 To help find records about his father, I have researched the heck out of his children from all of his marriage. His mother on the other hand... I haven't looked twice at her children from her first marriage. I just realized this and was struck by it. The children of Amelia's previous marriage are just as much Nathan's half-siblings as the children of Williams's previous marriages are. Why did I only look at William's kids? Researching Amelia's kids should tell me more about her and my half-aunts and uncles. I think it has to do with surnames. William's children shared the Britt surname with Nathan and Amelia's did not. I'm not really sure what other reason there is that I completely disregarded my Great-Grandfather's half siblings. I can think of at least one other family where I've done something similar. Well, at least I recognize the holes in my research and can now correct them. Maybe I'll connect with some new cousins when I'm done.